We hope to see you in San Jose. We are investors in the Test, Measurement and Monitoring Industry and would welcome the opportunity to meet with you and tell you more about what we do. Please contact us if you would like to set up a meeting. Summit Park is a Charlotte, NC based private equity firm that invests in companies with $10 to $100 million in revenues. We believe our team's direct experience in the test and measurement industry gives us a unique and differentiated investment perspective in the sector. We strive to be the partner of choice for owners and management teams who share our mission of building companies of extraordinary values. To learn more about us please visit www.summitparkllc.com. Rachel Hannon is the Director of Business Development at Summit Park, and leads the firms investment efforts in the Test & Measurement industry. She is responsible for developing relationships with private companies and sourcing new investment opportunities that fit within Summit Park's focus. Rachel also works closely with Summit Park's portfolio company in the Test & Measurement industry, Control Company. 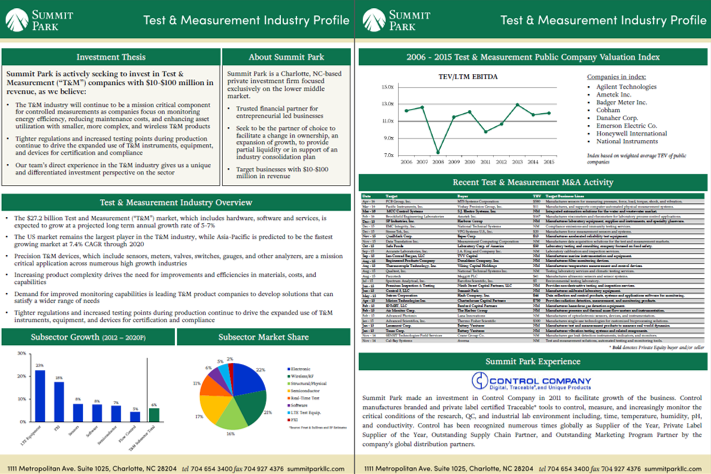 Tom Fatur is an Adviser to Summit Park and has 30 years of experience in the Test & Measurement industry. He founded Martel Electronics Corporation, which was acquired by Fluke Corporation (a Danaher company) in 2011. Tom focuses on financial investments, as well as investments of time where he can offer assistance to management teams to help them achieve their goals. Currently he serves as a board member of Summit Park's portfolio company, Control Company. Control Company sells an extensive array of private label and branded laboratory equipment including thermometers, timers, tools, humidity gauges, hygrometers, and conductivity tools. These products are sold globally through large distribution partners, and Control enjoys strong, longstanding, and mutually beneficial relationships with the two largest distributors in the industry. Unique among its competitors, substantially all of the company's products are individually calibrated and tested and sold with a Traceable® Calibration Certificate issued from the company's calibration laboratory, which is accredited by the American Association for Laboratory Accreditation. Summit Park invested in Control Company in 2011 and led the company's recapitalization in 2015. If you would like to set up a meeting at the Sensors Expo, please reach out to Rachel Hannon, Director of Business Development at Summit Park at 704-654-3400 ext. 240 or rhannon@summitparkllc.com.